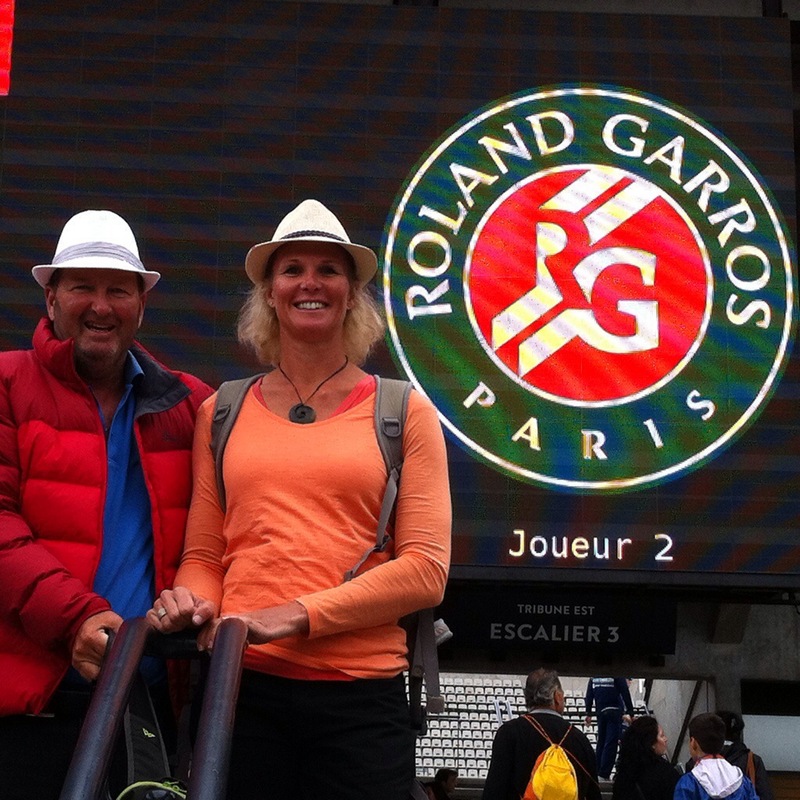 Today we went to Roland Garros to watch day three of the first round. I was so excited that I woke at 5.15am and couldn’t go back to sleep. We caught the RER and then the Metro to the stadium – was a bit nervous about getting on the wrong train but it was a piece of cake. You’ve just got to understand what the end destination point on the line is so you can make sure you get on the train that is going in the right direction. 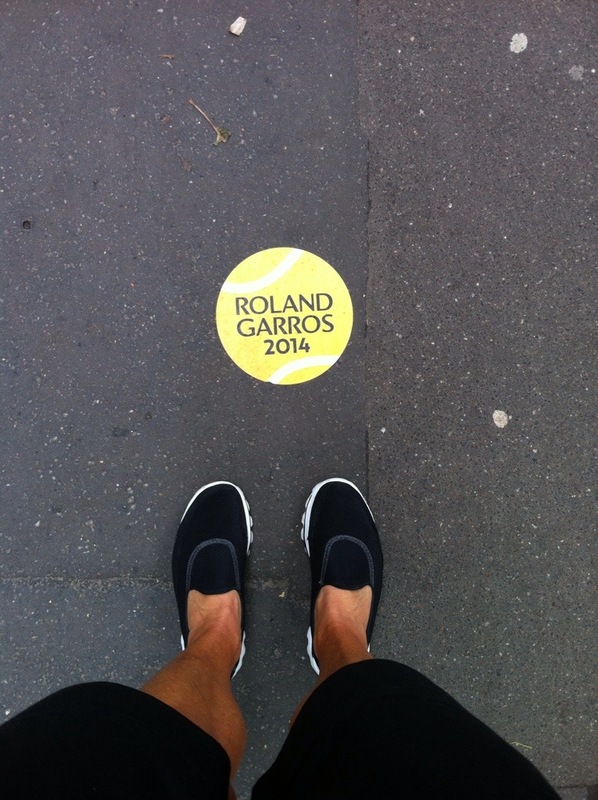 We got off the Metro at Michel-Angel Auteuil and went to navigate our way to the stadium and there were all these footsteps and tennis balls on the pavement showing us the way. Got to the stadium and lined up ready to go in. It is quite a large complex but very well laid out and organised. 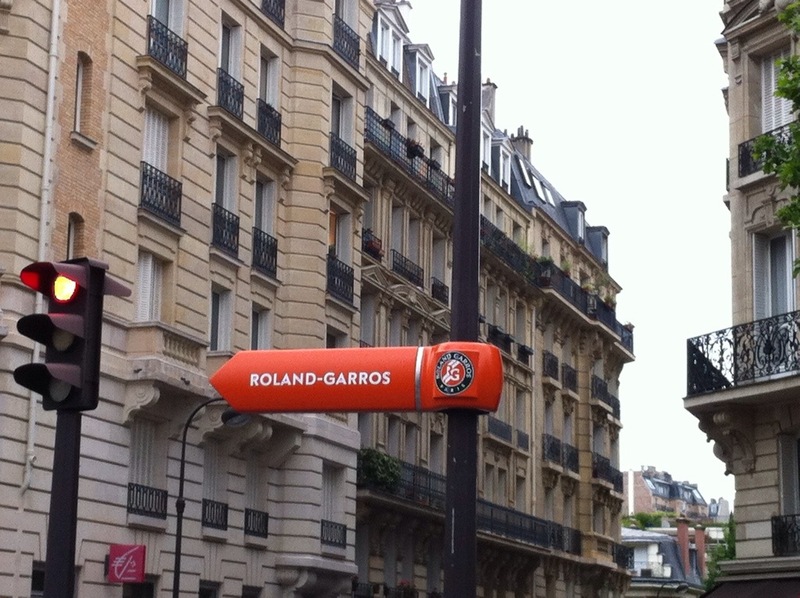 They have a tennis museum which also has a large part dedicated to Roland Garros – who is Roland Garros you ask? Well he is not a famous tennis player for starters. Eugène Adrien Roland Georges Garros was born in Saint-Denis, Réunion, and studied at the Lycée Janson de Sailly and HEC Paris. He started his aviation career in 1909 flying Alberto Santos-Dumont’s Demoiselle (Dragonfly) monoplane, an aircraft that only flew well with a small lightweight pilot. He gained Ae.C.F. licence no. 147 in July 1910. In 1911 Garros graduated to flying Blériot monoplanes and entered a number of European air races with this type of machine, including the 1911 Paris to Madrid air race and the Circuit of Europe (Paris-London-Paris), in which he came second. In September he established a new world altitude record of 5,610 m (18,410 ft). 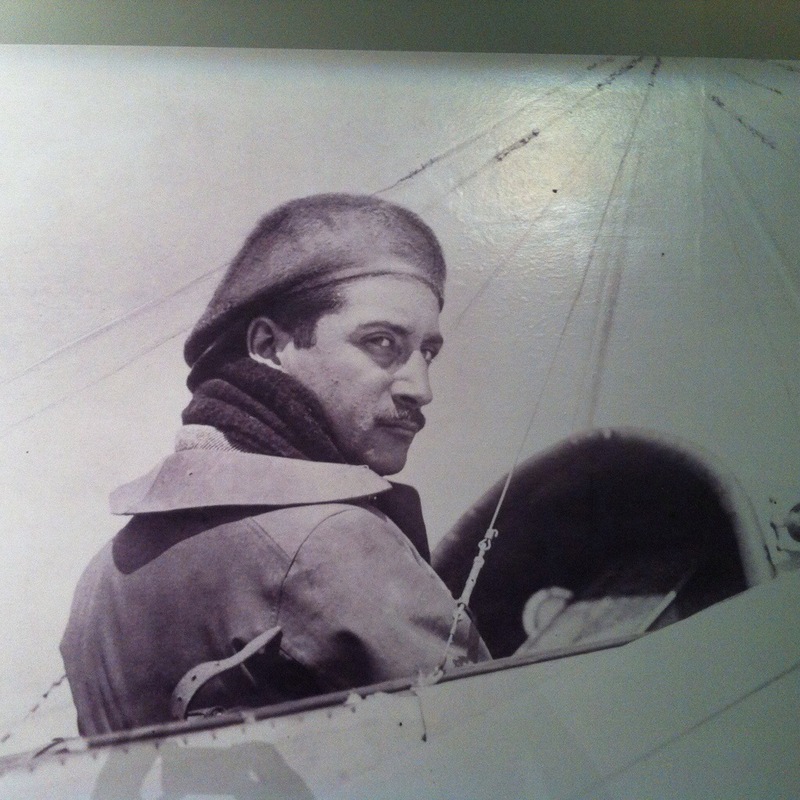 By 1913 he had switched to flying the faster Morane-Saulnier monoplanes, and gained fame for making the first non-stop flight across the Mediterranean Sea from Fréjus in the south of France to Bizerte in Tunisia. 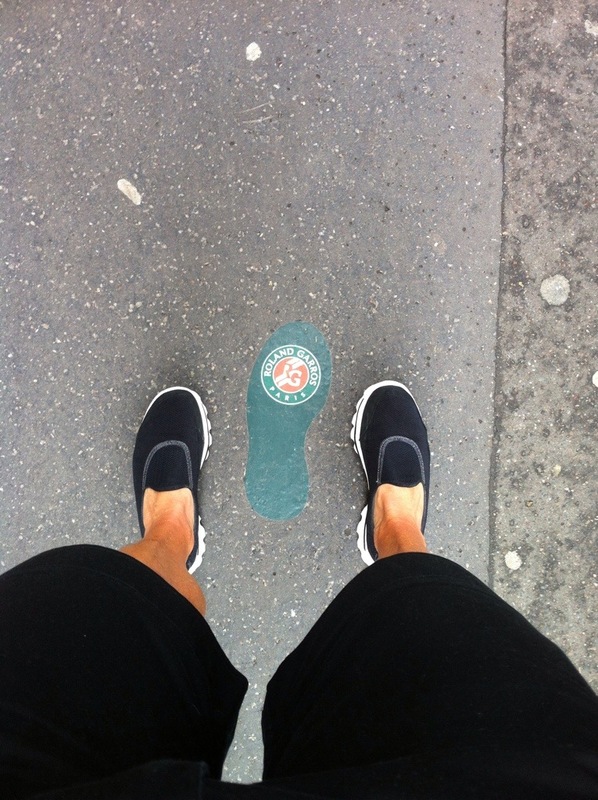 The following year, Garros joined the French army at the outbreak of World War I. After achieving a number of things in World War 1 in the aviation arena he was taken prisoner. He managed to escape the POW camp and went on to re join the French Army before his plane was gunned down on the 5th October 1918, one month before the war ended and one day before his 30th birthday. In the 1920s, a tennis centre which he attended religiously when he was studying in Paris, was named after him, Stade de Roland Garros. 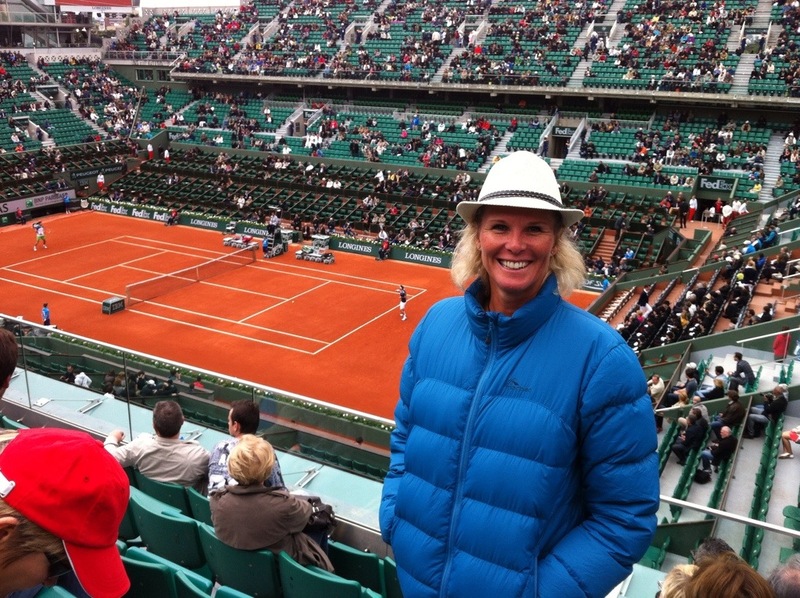 The stadium accommodates the French Open, one of tennis’ Grand Slam tournaments. 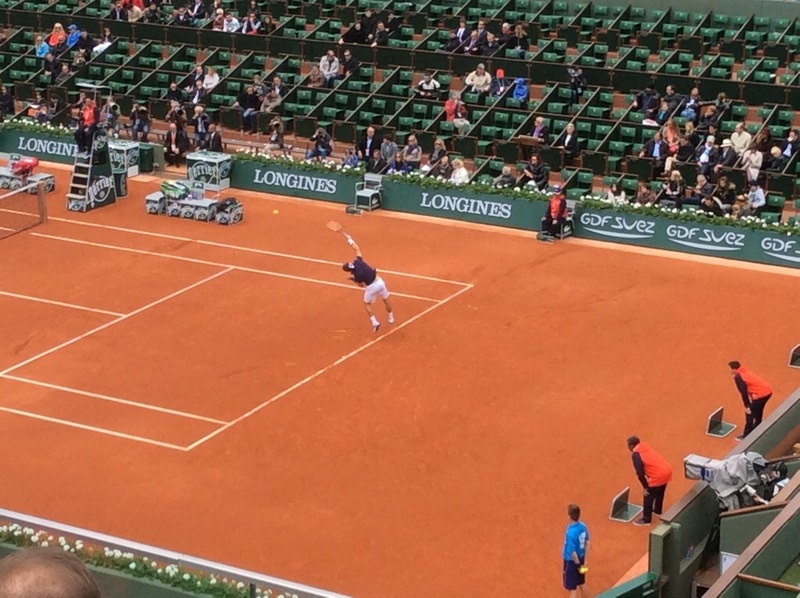 Consequently, the tournament is officially called Les internationaux de France de Roland-Garros (the “French Internationals of Roland Garros”). The international airport of La Réunion, Roland Garros Airport, is also named after him. The French car manufacturer Peugeot commissioned a ‘Roland Garros’ limited edition version of its 205 model in celebration of the tennis tournament that bears his name. The model included special paint and leather interior. Because of the success of this special edition, Peugeot later created Roland Garros editions of its 106, 206, 207, 306, 406, and 806 models. From the first ball games in Ancient times to Rafael Nadal’s victories, tennis, in all it’s different forms, came slowly into being in Greek mythology, Nausicaa is the first to play with a ball, leading to pila played by the Romans, and then making way for jeu de paume (“game of the palm”), which was codified in 1555. Across the English Channel, the invention of lawn tennis by Major Wingfield, in 1874, marks the beginning of a new pastime for high society, played during garden parties and which rapidly turns into competitive events. Thus begins the tennis adventure. From 1891 the first French championships, ancestors of the Roland Garros tournament, are held in front of a very small public. 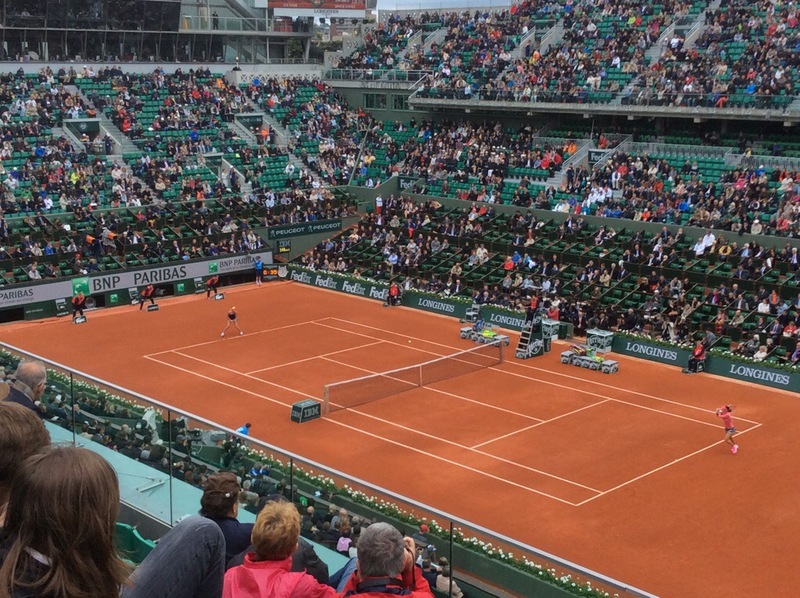 In the 21st century, the French Open welcomes nearly 450,000 spectators every year and attracts almost 3 billion television viewers. 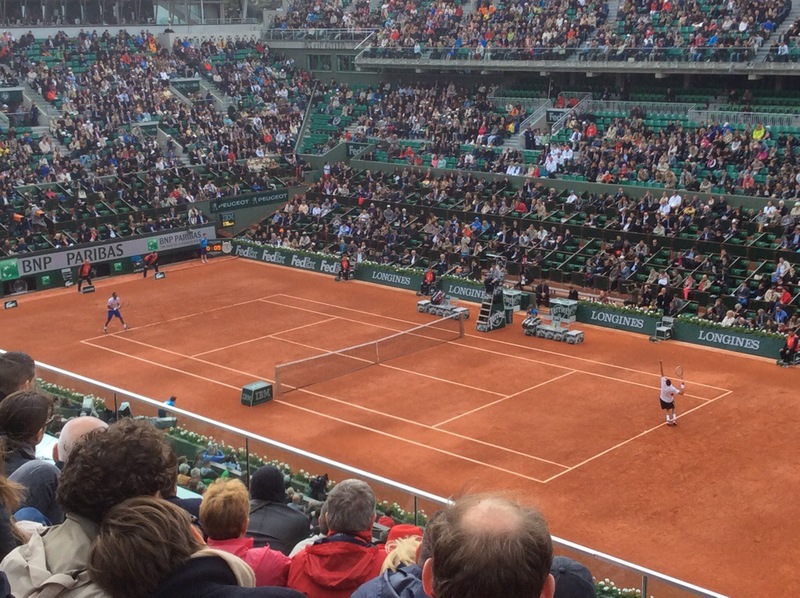 In 1928, following the Musketeers triumph in Davis Cup, Roland Garros stadium is built and becomes home to the French Open. Like the three other Grand Slam events (the Australian Open, the US Open and Wimbledon), the historical stadium, where the legendary tournament filled with spirited emotion is held, writes the pages of tennis history. 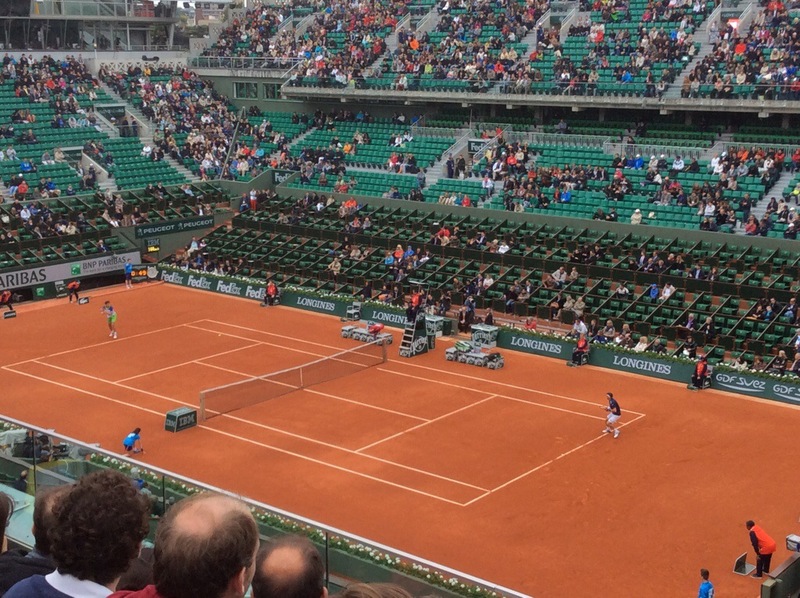 Note that the French Open is played on a clay surface, the Australian and US Opens are played on a concrete surface and Wimbledon is played on a grass surface. Despite the weather being very overcast and looking like at least spitting with rain we were fortunate enough to stay dry all day and watch four singles games – two men’s and two women’s. The sun actually came out about 5.30pm- we have noticed that this is quite common in Paris. The day starts off very glum and by early evening it is quite pleasant. Simona Halep from Romania – 22 years old and ranked number 4 in the world versus Alisa Kleybanova from Russia – 24 years old and ranked number 87 in the world. Simona won in two sets. David Ferrer from Spain – 32 years old and ranked number 5 in the world versus Igor Sijsling from the Netherlands – 27 years old and ranked number 55 in the world. David won in three sets. David Ferrer is NZ’s favourite Spaniard – he has come to play in the Heineken Open in Auckland many times and has won it many times although he didn’t make the final in 2014. Ana Ivanovic from Serbia – 27 years old and ranked number 12 in the world versus Caroline Garcia from France – 20 years old and ranked number 43 in the world. 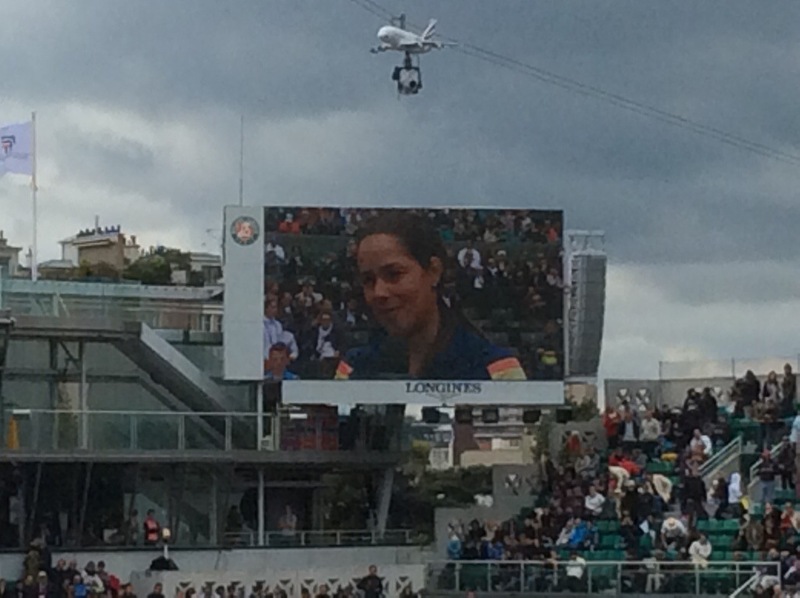 Ana won in two sets. Ana Ivanovic played in the ASB Classic in Auckland in January 2014 and won it. Gael Monfils from France – 28 years old and ranked number 28 in the world versus Victor Hanescu from Romania – 33 years old and ranked number 85 in the world. Gael Monfils won in four sets. This was the best game of the day. Gael Monfils has been to Auckland to play in the Heineken Open before – he is a bit of a showman and quite fun to watch. It was a great day and we managed to navigate our way back on to the Hotel on the RER and Metro. 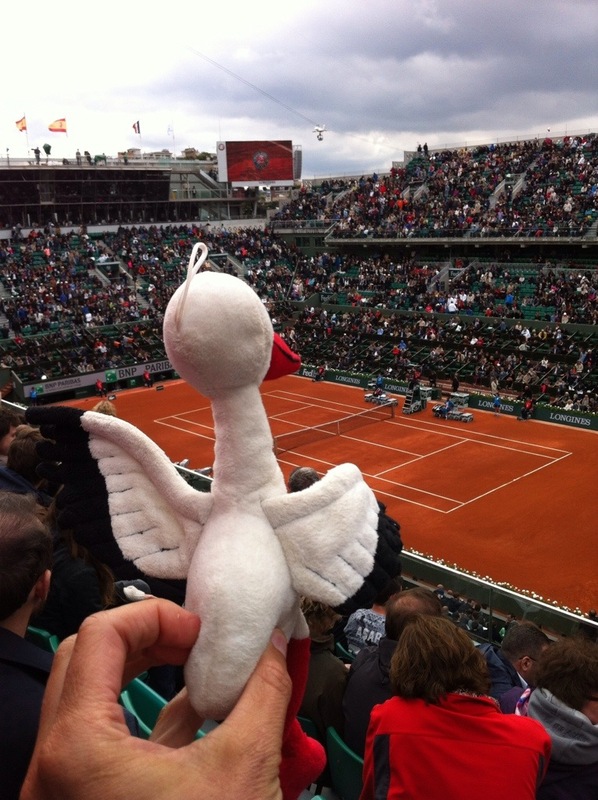 I hope Pinot is as excited about the tennis as you are!